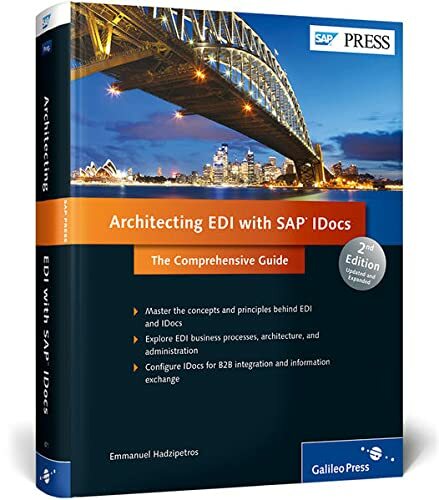 [PDF] Architecting EDI with SAP IDocs: the Comprehensive Guide, 2nd Edition | Free eBooks Download - EBOOKEE! Description: Welcome to Hollywood! Follow the saga of the Acme Pictures movie studio as it exchanges information with its vendor and its primary customer to put low-budget sci-fi movies on shelves. This entertaining case study showcases the requirements, standards, and capabilities for building an SAP EDI system and optimizing electronic information exchange via IDocs. From configuring IDocs, to customizing IDocs with ALE, to generating purchase orders and goods receipts, to processing invoices, this script teaches you how to make your EDI system a star. No comments for "[PDF] Architecting EDI with SAP IDocs: the Comprehensive Guide, 2nd Edition".